Champagne Toast (and more oil rigs!). As I mentioned in my previous post on the second dive of the oil rigs Jessica brought along a little bottle of champagne for an underwater toast to my 100th dive! She just finished editing an awesome video of the day, and it includes a shot of my taking a nice swig of champagne while getting checked out by a curious sea lion. I’m not going to lie, while a bit salty, it was really entertaining to drink a little bubbly underwater with a sea lion! How many people can say they’ve done that? Enjoy the video, its fantastic! (Thanks to Jessica for letting me share!) The champagne toast is at the end of the video, but watch out for her amazing shot of one of the Salp colonies, its my favorite! Diving the Oil Rig Eureka. When I tell some of my non-diver friends that I am heading off to dive an oil rig this weekend I often get weird looks and questions like, “why would you want to do that?”, “what is there to see on an oil rig?” Well, for those who haven’t experienced it, the answer is quite a lot. I love diving the oil rigs because they offer an experience unlike any other. The boat ride is short; they pull up close to the rig and as many people as possible plunge into the ocean and swim away from the boat. Often there is a pause in off loading divers so the boat can reposition itself to avoid drifting into the rig. Its all bit chaotic and rushed, buts it’s exciting. Once off the boat you swim inside the rig structure (being careful to mind the swell so it doesn’t push your head right up into a large beam). Then the boat drives away! It doesn’t go far, but it can’t anchor to anything and has to keep a safe distance from the rig. 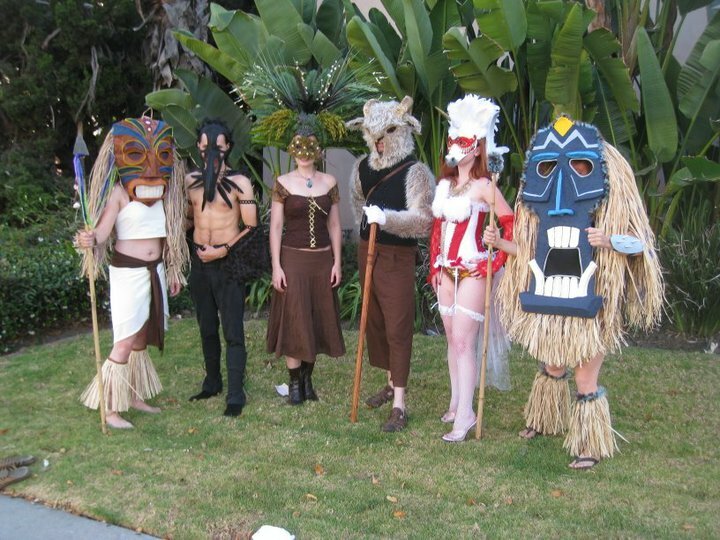 After grouping up with your buddies you descend straight down into the abyss. Depth for these dives is totally up to each diver, you can go all the way down to the recreational limits if you wanted. On Saturday we decided that we would go down as deep as we could until either someone got narc’ed and wanted to stop, or we reached 130′. Having never been narc’ed (though I’ve been deep – to 125′ before) I was curious if this would be the dive. It surely was. We dropped down fairly quickly and as soon as we hit around 112′ my heart started thumping and I realized that I felt funny. We kept going down and at 117′ it was too much, I was giddy, excited, could not stop smiling, then actually started to laugh out loud for a little bit before my higher brain function took over and said, “Hey Kelli, you’re totally narc’ed! Pay attention, mind your depth, how’s your air, stay focused!” For those who don’t know, being “narc’ed” is encountering Nitrogen Narcosis, which is an overload of nitrogen in your system that occurs from breathing excess nitrogen due to increased pressure in your breathing gas during a deep dive. It’s really non-life threatening, mostly makes you feel drunk, silly or impaired in some way. My buddy Beck, got very anxious and tenses up when narc’ed, while I went all giddy and couldn’t stop smiling. Anyways, after this realization I gave Beck, Jessica and Bryan signals to say, I’m narc’ed! Lets level out here, I don’t want to go any deeper! Once we reached that depth, all that was left was to go back up. So we started our ascent, and really our dive. As we slowly ascended back through the structure we swam around, over, and through the various metal crossings, and beams. Everything was absolutely covered with life. Corals and anemones covered every inch of the structure. Sea fans grew, and brittle stars lay in bunches on top of other growth. Hiding in holes and crevasses of the corals and anemones were small fish that would dart in and out as you got near. Large fish rested on the beams as well, or swam around inside the structure. We encountered huge schools of baitfish swimming through, and sea lions would glide down from the surface, effortlessly moving around us before bolting back up. The oil rigs are probably one of the most surreal dives I’ve experienced, as you watch the large beams that plunge into the depths and the giant cross sections that support those beams all materialize as you near them. Hazy shapes take form as you slowly ascend back towards them. The whole dive is really mysterious and completely unique. I saw several new creatures on these two dives. We encountered several colonies of Salps. 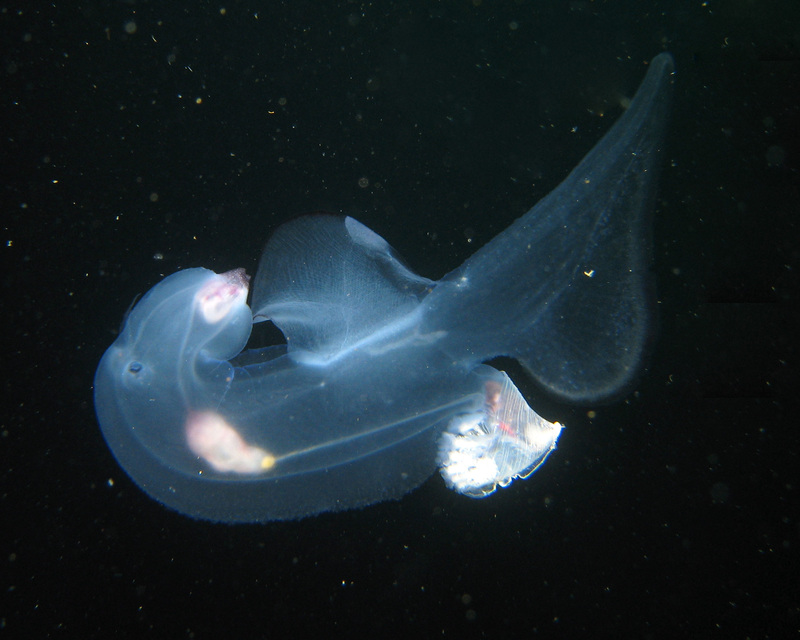 A salp is typically a barrel shaped, free floating tunicate (underwater, saclike filter feeder). They float along in the ocean, move by contracting and pumping water through its body, which it also feeds off of. I saw two, possibly three different types. 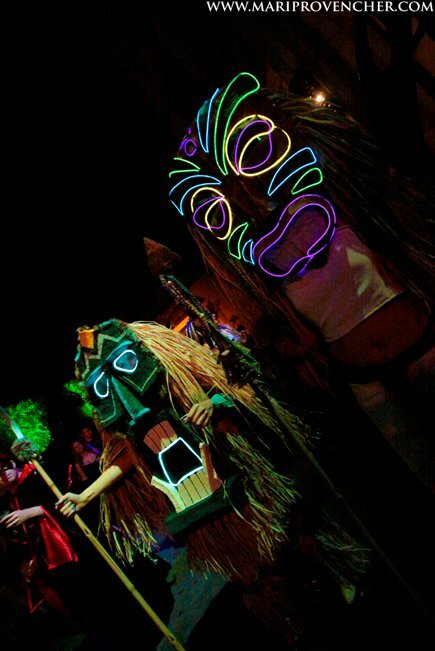 One was a long chain, at least 5-7′ of small tubes all joined together. It would curl and uncurl as it floated along. The other was a series of three rings joined together with golden parts inside, and the third, if even a salp, looked like a single organism and was almost fish shaped. It moved along with the use of one larger fin that swung back and forth over its body. This year, these two dives happened to fall on a big milestone for me. Dive #99 and #100 were my two oil rig dives. I’ve now hit triple digits in my number of dives and to celebrate, my friend Jessica brought a small bottle of champagne down in her BCD pocket. During our safety stop around 15′ she pulled it out and popped the cork. We each took a nice big swig, doing our best to block the opening with our finger in an attempt to keep out as much sea water as possible. It was awesome, and to cap it all off, we had a very curious sea lion that kept swimming down to our group and checking out what we were doing. I tried to offer him some champagne, but he wasn’t really interested. Our day had started with another rare event, Blue Whale sightings just off our bow. There were several whales surfacing in the channel, so the boat stopped and we watched from a distance as these majestic creatures slowly rose up, took a nice big breath, and dropped back below the surface. We were lucky on the return to run into the whales again, much closer this time and watched them rise and fall in the water, their smooth backs gliding out of sight each time they dropped back down. It was my first time seeing a Blue Whale, and they really are as big as all the books say! It was insane to see something that big with my own eyes. I could not have asked for a better 100th dive, and even got to celebrate with the entire boat on the way back, as Jessica pulled another full size bottle of champagne, some orange juice and plastic cups from the cooler and poured mimosas for everyone, she then raised her glass in celebration of my dive, and everyone followed suit. It was great. Friday night Jessica, Bryan and I ventured back out to Veterans Park to squeeze in two quick dives that would bring my total dive count to 98. We did this because we were diving the oil rigs off of Long Beach the following morning and I desperately wanted to make the oil rig dives fall on my 100 dive. 100 is a pretty big milestone in the dive world and I was extremely excited to be hitting it. Everytime I dive Vet’s I have gone south. Its a west facing beach, so we swim west to the depth we want, then turn south in the canyon and swim down until either our air or time limit is up and we turn around to swim back to the entry. 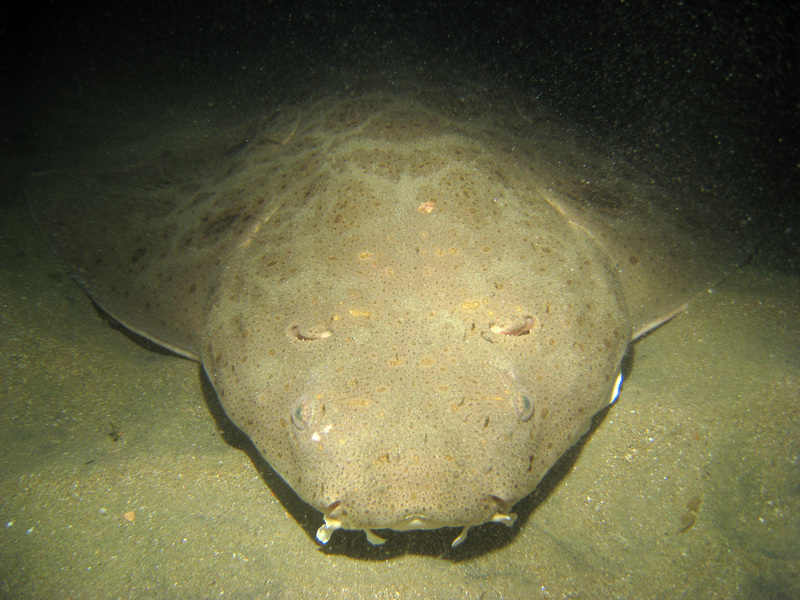 Vets is all sandy bottom, so its not the most exciting dive, but in the evening or at night there are a plethora of creatures that come out. Typically you see octopus, crab, small fish like scoropionfish, sarcastic fringehead, cusk eels, lots of sand dollars, and sea stars. Friday however, we decided to explore north for something different. There is supposed to be a large grassy area, known as the “Salad Bowl” just north of the stairs that you use to get to the beach. We were told that you can find more life in this area than you usually see heading north, and that often there are nudibranch hiding out in the grass. Either, we didn’t swim far enough or it just wasn’t a good day for nudi hunting. The grassy area was fairly sparse, and while there were a bunch of little octopus swimming around that was about it. I saw a nice scorpionfish and was able to get a great shot of him resting in the sand, but otherwise it was a rather boring and cold couple of dives. However these two dives weren’t really for quality, they were for quantity, and by completing them I was able to align the oil rigs and my 100th dive! Fin straps. They really aren’t that bad, typically a piece of rubber that ratchets tight through two plastic clips often with a quick release making it easy to remove. Simple contraption, easy to use, so really something that wouldn’t need an upgrade right? 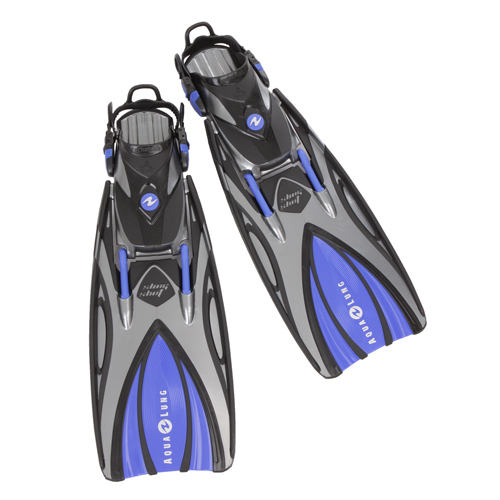 The moment I got my new fins earlier in the year I heard, “sweet, those are great fins, now what you really need are some spring straps.” Most of my scuba buddies have spring straps, and all of them exclaim how wonderful they are, but I never really bought into it. I’d never had too much trouble getting my fins on and off in the surf, so why spend extra money on something that wasn’t really necessary? Well fast forward a bit to a couple of beach dives where tiny bits of sand got stuck in the quick release mechanism of my regular fin straps. Those granules made it impossible to fully depress the button and release the fin straps which meant I was stuck sitting in the surf zone getting battered by wave after wave as I tried in vain to remove my fins. On one occasion I even had to crawl out of the water, sit in the sand and then pull them off, pretty embarassing. Not to mention that I was cleaning sand out of every piece of gear for weeks. Needless to say, the idea of spring straps began to grow on me. So what’s so great about spring straps? 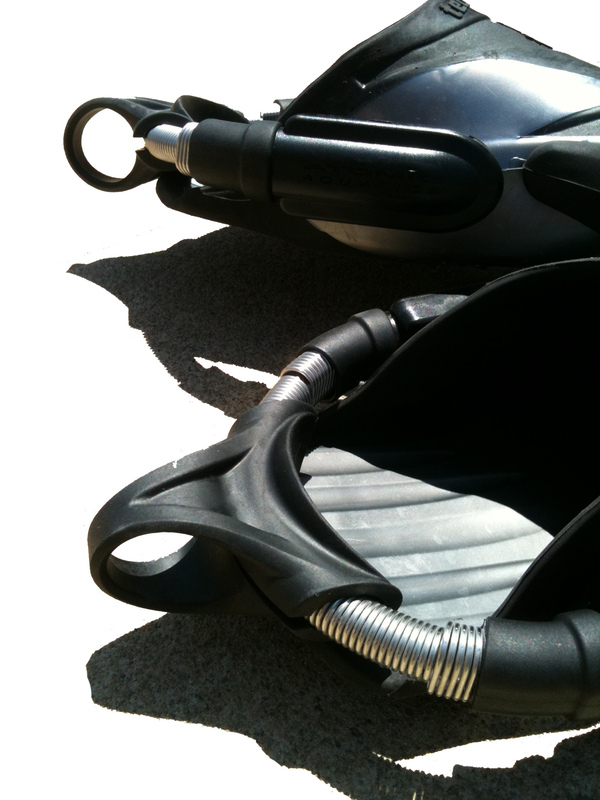 Basically they are a high tension spring that you fit to the size of your foot in your fin so that there is no longer any adjusting of straps to get the proper tightness keeping the fin secure on your foot. In addition, since it’s a spring, you no longer need the quick release for getting out of your fins because you just pull back on the large, easy to grab (even in gloves) loop and then slide the fin off your foot. Magnificent. I pushed the idea of upgrading to the back of my head because I had much more important (and expensive) things I needed to be putting my money towards, namely my Instructor class, and the upcoming Instructor Exam. Then I went out with Brett as an assistant one Sunday when he had 9 students for Open Water and ended up rescuing a student’s fancy expensive watch from the bottom of the ocean. It really was just luck; he had tried to stay in one spot while floating on the surface looking for it, but I noticed he was drifting, called him back over and said we’d do a quick search on the bottom once we descended. I then glanced down below me and noticed something shining on the bottom. Once Brett surfaced with another diver he was completing a CESA with, I asked him if I could drop down real quick and see if it was the watch. It was, and the student was so grateful that I managed to recover it, that he put a $100 credit on my account at Eco. A ll in all I was amazed, it was totally more than necessary, especially since it was total luck that I happened to spot the reflective face of the watch from the surface, and that it didn’t get buried in the sand when it sank. However, the credit was there, and now I had free money to spend. So I bought myself a nice shiny new pair of spring straps for my fins. It took a little bit sitting on the couch to get them adjusted and installed on my fins, and then later in the week I went out for a dive and got to test them out. It was beautiful. The ease of being able to slide my foot in the fin then just let go and the strap sprang back tight against my foot immediately was fantastic. There was no struggling to adjust the strap and get the next fin on before the next wave hit, no issue of making sure I had them loose enough before entering the water, just pull, let go and swim away! 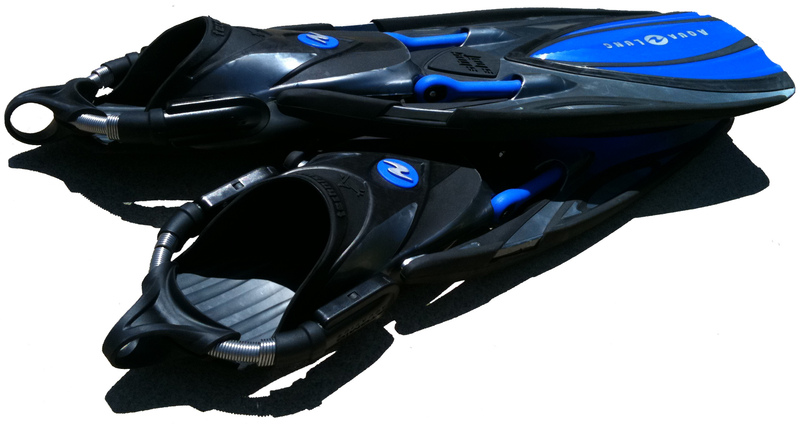 The straps were comfortable and held my foot securely in the fin the whole time, and exiting the water was a breeze. I just had to grab the loop, pull back the spring and off the came. 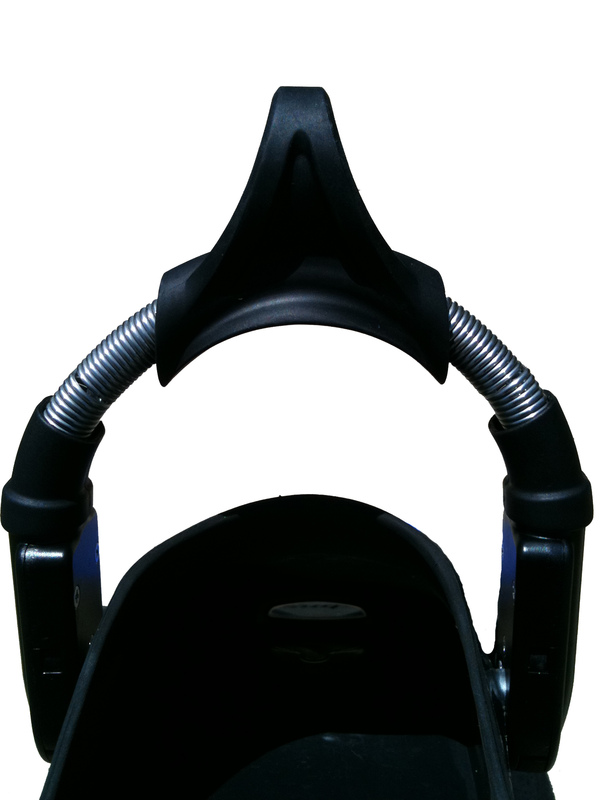 No more struggling with a finicky quick release. Seriously, I would recommend spring straps to anyone now, especially if you do any beach diving. I totally understand why they exist and why everyone kept telling me I needed to get them. So thanks Dan, for your gracious credit, and I can’t wait to get in the water again! Friday night I ventured out with two friends to explore a favorite site of mine after dark. I was slightly worried because the weather forecast had shown larger waves than the earlier prediction and this site mucks up quickly because its fairly shallow. I had also been dry for about two weeks, after the delay of my instructor exam date I decided to take it easy and have been picky about choosing my dives. However, after a stressful week at work (read: probably going on “hiatus” in a few weeks due to how crappy things are going in the industry), I just needed to be underwater. We met up in the parking lot, and the ocean was calm and quiet. So far, so good. Daryl, Richard and I gabbed as we donned our gear, I made the last minute decision to bring the camera since the calm seas meant I wouldn’t have to stress over it getting battered on the rocks during the entry and exit, and I am SO glad that I did. As we kicked out along the surface I could tell that the visibility was going to be good and my spirits rose. We dropped down in about 15 feet of water and began kicking over the sand towards the dive site. Our max on this dive was 24 feet, so you can imagine how quickly it would go from good to bad with a larger surf, but that night we lucked out. On top of the great conditions, it seemed that everything was also out enjoying the night. We ran across a small thornback ray immediately after dropping down, then crossed paths with a large horn shark as we swam into th e kelp and rock ledges. 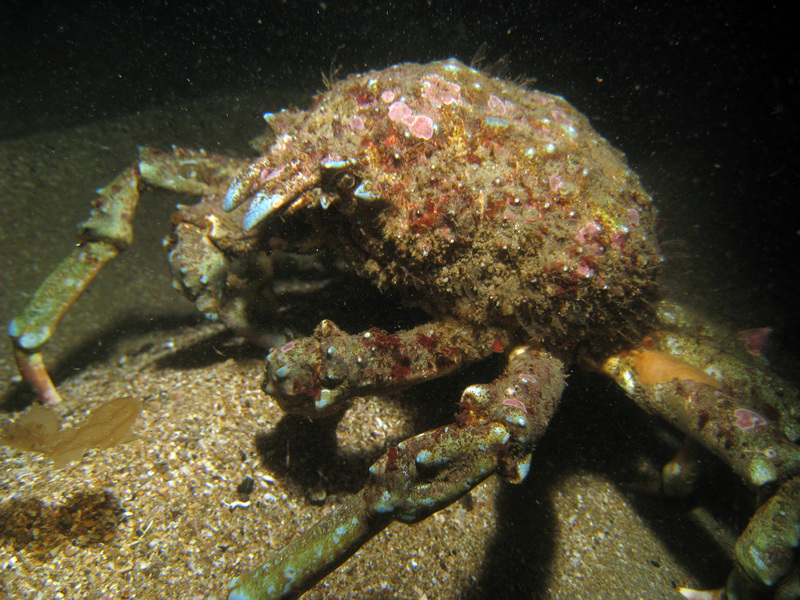 There were large Sheep Crabs wandering across the sandy patches in numbers I had never seen before. We must have passed at least 10 throughout the dive! 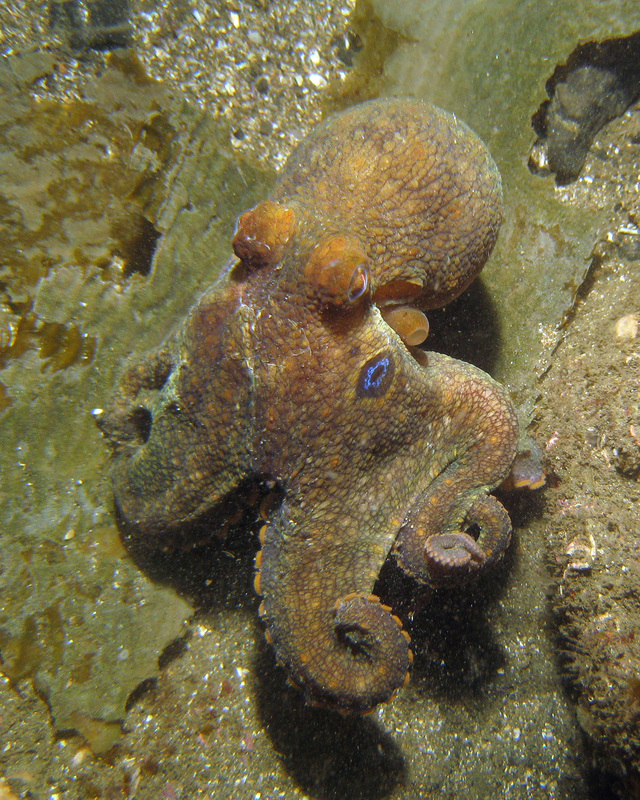 Richard pointed out an octopus all stuffed into a tiny hole in a rocky outcropping as we swam over and through the ledge-like outcroppings that mark Malaga Cove dive site. The most entertaining for me (aggravating for Richard) were the lobster. They were everywhere and they were docile and unafraid. Usually lobster hide in holes in the rocks, or in crevasses just out of reach, but tonight they were out swimming around, lounging on top of the rocks in plain sight and easy grabbing proximity. To top it off, they didn’t swim away when you got near. I was even able to pick one up, though was so startled by the fact that I could that I dropped it immediately as soon as it squirmed. 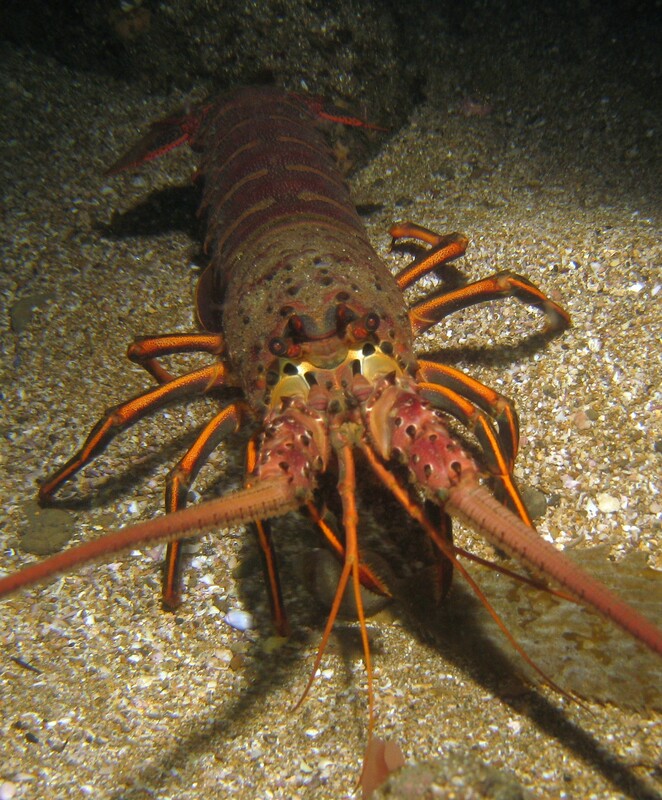 Richard, who is a hunter, could not believe they were just out like this and was extremely bummed that it was not lobster season. Soon, Rich, soon.. . season opens midnight on October 1st. As we continued the dive it just got better. 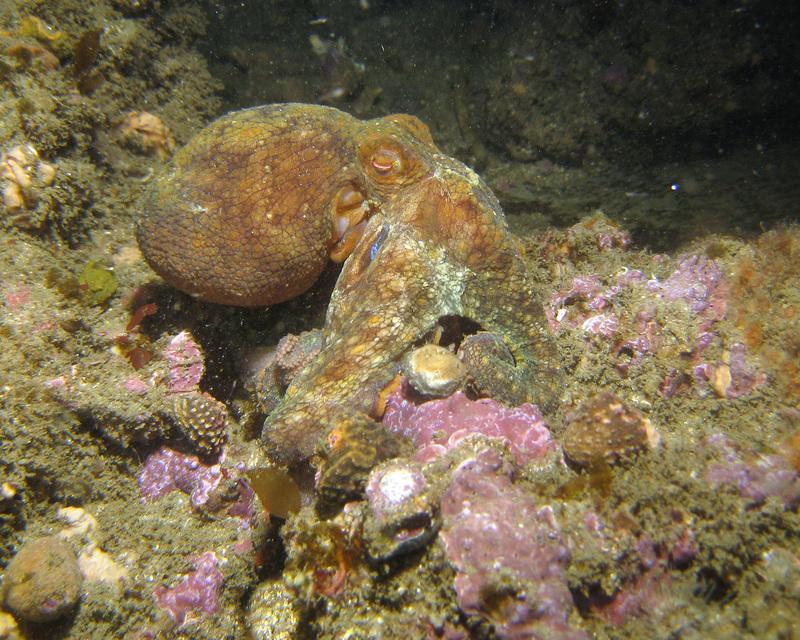 I found a nicely sized octopus out and about and was able to follow him as he swam along the rocks, molding and melting to whatever shape he passed over. 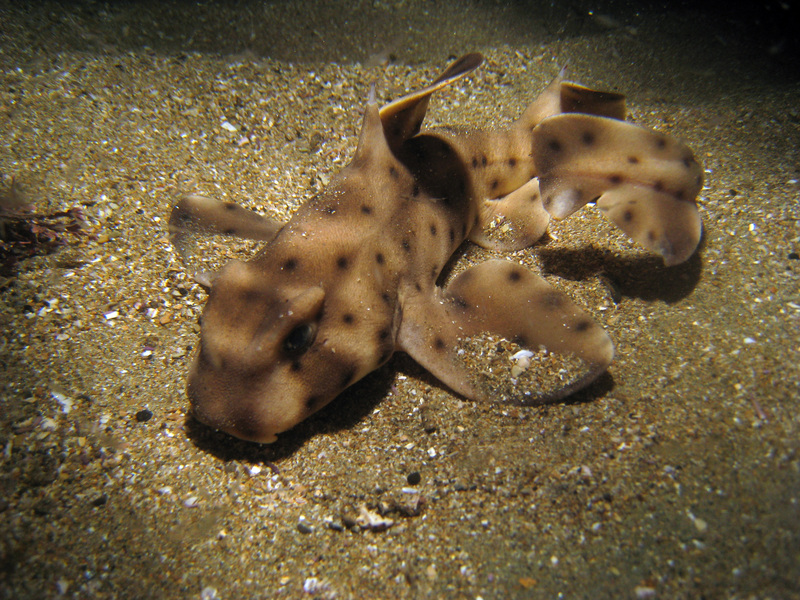 Towards the end I ran across a tiny little baby Horn Shark just curled up against a little rock cluster. As we returned to the sand at the end of the dive we ran across another Thornback Ray, larger this time, and in no hurry to swim away as I snapped picture after picture. 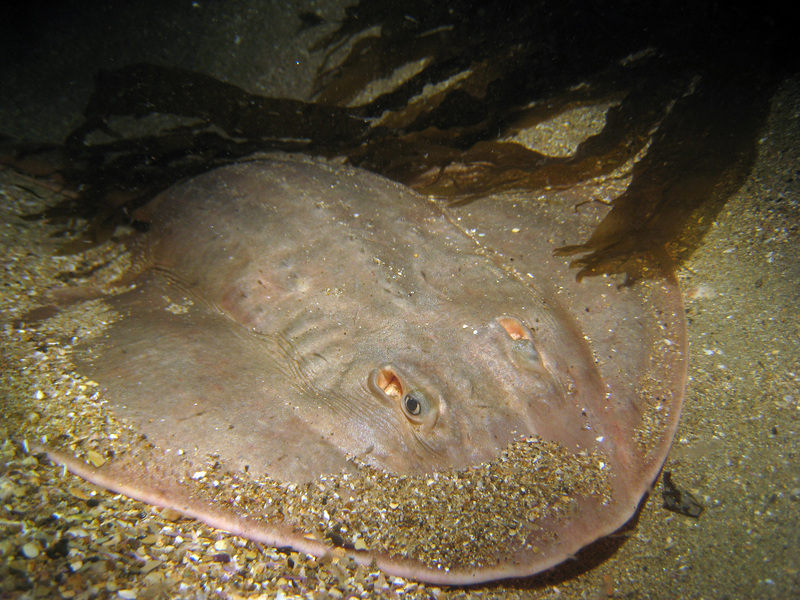 Then just before we surfaced we stumbled onto a large Pacific Angel Shark nestled in the sand. Really, what more could we have asked for?